Years ago, after explaining the gospel to a student from Pakistan, he responded, “I agree with you on everything except the part about Jesus. If Jesus is God, where is justice and why did he not bring it?” How would you answer that question? If God is truly sovereign, where is justice to be found? Where is justice to be found when terrorists plan attacks on tourists and innocent bystanders? Where is justice n the face of school shootings and other acts of senseless violence? Isaiah answers that question Isaiah for the Jewish exiles in Babylon in this first Servant Song. The foundation of this new kingdom will be a suffering servant who will be everything Israel was intended to be and who will bring justice to the nations. Isaiah 41 ends with the LORD challenging the idol-gods to predict the future or explain the past (Isaiah 41:21-29) — a test they fail. He concludes: “Behold, they are all a delusion; their works are nothing; their metal images are empty wind” (Isaiah 41:29). In contrast, then the LORD says in 42:1 “Behold my Servant” and he tells of the works of Jesus Christ about 700 years before Christ was born. The nation of Judah is going to humbled, but will not be destroyed. God’s people have a glorious future waiting because God’s discipline will result in the people returning to God and becoming a truly righteous people. We’re going to see that same kind of spiral progression in the Servant Songs. The first song is short and vague. His focus is to proclaim the Servant’s task, not his identity. He will reveal more with each song. This language echos the public calling of a king. Compare with Mark 1:9-11. As an accolade, “servant”refers to one who is chosen as an instrument to further the kingdom of God and/or one who serves God with his whole heart. “Chosen” like the nation Israel, the Servant will be everything Israel was intended to be but wasn’t. The Servant will “bring forth” a new kind of justice: freedom from the tyranny of sin. The Servant will have the full measure of God’s Spirit. Compare with Numbers 11:4-25. The Servant will not seek His own justice. If any man could claim superiority, it was Jesus because he was the visible representation of the invisible God. He had the right to speak for God and to be the Lord and Master and to expect us to serve him. Yet he served us. Compare with Philippians 2:1-11. Instead, the Servant will seek justice for others. The image of the “bruised reed” is that nothing is useless, even a bruised reed. While the “smoldering wick” carries the idea that nothing is too far gone, even a smoldering wick. Both those images point to the fact that he will lift up the spiritually poor and broken. Compare with Matthew 11:28-30. The Servant will establish justice for the nations. 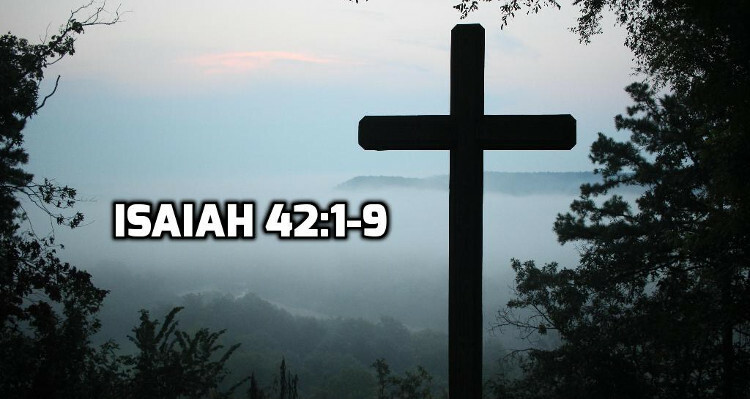 In Isaiah 42:1-4, the Lord spoke about His servant and now He directly addresses the servant. God called the Servant to bring about righteousness (this theme of bringing justice to all the nations). This new covenant will be different than the old covenant. Because of the Servant, God will pour out His spirit on all His people and free them from the tyranny of sin. God alone (not idols) is the accomplishing this new covenant with the servant and He alone is worthy of praise. All the LORD’s previous prophecies have proven true. Now He is declaring this new prophecy and this new covenant will also come to pass. One day the exiles will look back and see that God freed them from Babylon through the Persian King Cyrus. The prophecy of the Servant would be in their future. But it is in our past. We can look back and say: God’s word is true and sure. The Servant Isaiah predicted years ago has come into the world and accomplished the task that God set for him. We need only trust and wait for the rest of God’s word to be fulfilled.